My intent isn’t to make fun of the organizers of the local event I attended last night, so the name of the event and of its sponsors isn’t included in the photo above. 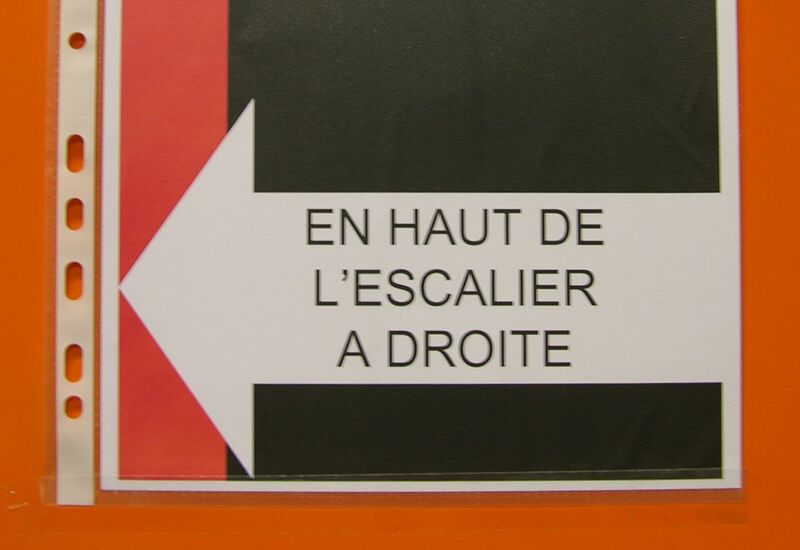 The text in the arrow pointing left reads: To your right at the top of the stairs. Fact: the hall of the Auditorium is indeed on the second floor and to the right of the stairs; to the left of the stairs, there are nothing but windows overlooking this sign on the door. Given the context, a sign like this is the type of thing that amuses me. As for the event itself, I needn’t have worried about dress code before attending: this is a rugby town. Ergo: 1)attendees were mostly men wearing rugby-appropriate attire; 2) in the supporting cast of wives and girlfriends, the four younger ones were pretty enough to hold all eyes; 3) therefore, the ten or twelve of us older women were free to look as dowdy, frowzy and/or lacking in fashion sense as we wished. In that contest, I wasn’t even in the top three. All of this carefully recorded as future reference for the French story, before heading back to the current project in English.